I dare all USA craft distillers to mature a Single Malt spirit in refill, yes refill, Charred American Oak barrels, previously containing your own Whisky, Rye or Bourbon (etc). Why the dare? I have always been told that USA whisky can only be made using New, Charred, American Oak containers. This is what has been told by many people. But is it actually true? I think that the re-use of barrels would greatly diversify the flavours and tastes coming from the USA whisky’s. Hence the dare. Would this kind of Whisky be considered legal? I think yes, it the distilleries make use of sections (2) or (3) of the code. Check out CFR-2011-title27-vol1-sec5-22, in order to find two options available to distillers. Where § 5.22 (b) (1) only allows for new oak containers sections § 5.22 (b) (2) and § 5.22 (b) (3) allow the use of used oak containers. (2) ‘‘Whisky distilled from bourbon (rye, wheat, malt, or rye malt) mash’’ is whisky produced in the United States at not exceeding 160° proof from a fermented mash of not less than 51 percent corn, rye, wheat, malted barley, or malted rye grain, respectively, and stored in used oak containers; and also includes mixtures of such whiskies of the same type. Whisky conforming to the standard of identity for corn whisky must be designated corn whisky. (3) ‘‘Light whisky’’ is whisky produced in the United States at more than 160° proof, on or after January 26, 1968, and stored in used or uncharred new oak containers; and also includes mixtures of such whiskies. If ‘‘light whisky’’ is mixed with less than 20 per- cent of straight whisky on a proof gallon basis, the mixture shall be designated ‘‘blended light whisky’’ (light whisky—a blend). I am Dutch so my English, or in this case my American English, may not be up to speed. Section (1) specifically identifies “charred new oak containers”. So section (1) is very specific. Sections (2) and (3) do not mention charred used containers, just used containers. Does that mean that sections (2) and (3) are intended to mean casks may not be charred in order to fall in this category? Or can used containers also be charred in order to be in the category “used“. This is why I say my answer to the question if new charred oak should always be used was “no” (sorta). Sorta meaning I may have misinterpreted the texts in (2) and (3). If so, please send me feedback. Are there many light whisky’s around? Nope, very very little in fact. Only 14 of these light whisky’s have been registered in 2016. So if more distilleries make use of “light whisky”, then a greater diversity could come out of the craft distillers of the USA and it would be economic as well. (a) Class 1; neutral spirits or alcohol. ‘‘Neutral spirits’’ or ‘‘alcohol’’ are dis- tilled spirits produced from any mate- rial at or above 190° proof, and, if bottled, bottled at not less than 80° proof. (1) ‘‘Vodka’’ is neutral spirits so distilled, or so treated after distillation with charcoal or other materials, as to be without distinctive character, aroma, taste, or color. (2) ‘‘Grain spirits’’ are neutral spirits distilled from a fermented mash of grain and stored in oak containers. ‘‘Whisky’’ is an alcoholic distillate from a fermented mash of grain produced at less than 190° proof in such manner that the distillate possesses the taste, aroma, and characteristics generally attributed to whisky, stored in oak containers (except that corn whisky need not be so stored), and bottled at not less than 80° proof, and also includes mixtures of such distillates for which no specific standards of identity are prescribed. (b) (1) (i) ‘‘Bourbon whisky’’, ‘‘rye whisky’’, ‘‘wheat whisky’’, ‘‘malt whisky’’, or ‘‘rye malt whisky’’ is whisky produced at not exceeding 160° proof from a fermented mash of not less than 51 percent corn, rye, wheat, malted barley, or malted rye grain, respectively, and stored at not more than 125° proof in charred new oak containers; and also includes mixtures of such whiskies of the same type. (b) (1) (ii) ‘‘Corn whisky’’ is whisky produced at not exceeding 160° proof from a fermented mash of not less than 80 percent corn grain, and if stored in oak containers stored at not more than 125° proof in used or uncharred new oak containers and not subjected in any manner to treatment with charred wood; and also includes mixtures of such whisky. 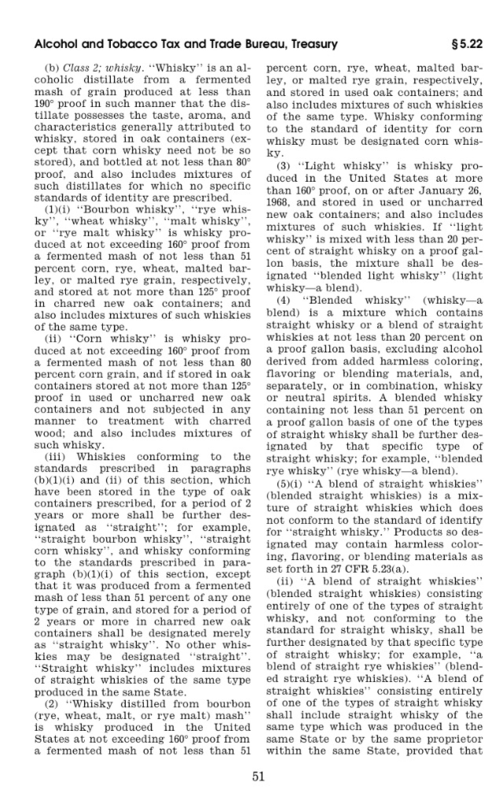 (b) (1) (iii) Whiskies conforming to the standards prescribed in paragraphs (b)(1)(i) and (ii) of this section, which have been stored in the type of oak containers prescribed, for a period of 2 years or more shall be further designated as ‘‘straight’’; for example, ‘‘straight bourbon whisky’’, ‘‘straight corn whisky’’, and whisky conforming to the standards prescribed in para- graph (b)(1)(i) of this section, except that it was produced from a fermented mash of less than 51 percent of any one type of grain, and stored for a period of 2 years or more in charred new oak containers shall be designated merely as ‘‘straight whisky’’. No other whiskies may be designated ‘‘straight’’. ‘‘Straight whisky’’ includes mixtures of straight whiskies of the same type produced in the same State. (b) (2) ‘‘Whisky distilled from bourbon (rye, wheat, malt, or rye malt) mash’’ is whisky produced in the United States at not exceeding 160° proof from a fermented mash of not less than 51 percent corn, rye, wheat, malted barley, or malted rye grain, respectively, and stored in used oak containers; and also includes mixtures of such whiskies of the same type. Whisky conforming to the standard of identity for corn whisky must be designated corn whisky. (b) (3) ‘‘Light whisky’’ is whisky produced in the United States at more than 160° proof, on or after January 26, 1968, and stored in used or uncharred new oak containers; and also includes mixtures of such whiskies. If ‘‘light whisky’’ is mixed with less than 20 percent of straight whisky on a proof gallon basis, the mixture shall be designated ‘‘blended light whisky’’ (light whisky—a blend). (b) (4) ‘‘Blended whisky’’ (whisky—a blend) is a mixture which contains straight whisky or a blend of straight whiskies at not less than 20 percent on a proof gallon basis, excluding alcohol derived from added harmless coloring, flavoring or blending materials, and, separately, or in combination, whisky or neutral spirits. A blended whisky containing not less than 51 percent on a proof gallon basis of one of the types of straight whisky shall be further designated by that specific type of straight whisky; for example, ‘‘blended rye whisky’’ (rye whisky—a blend). (b) (5) (i) ‘‘A blend of straight whiskies’’ (blended straight whiskies) is a mixture of straight whiskies which does not conform to the standard of identify for ‘‘straight whisky.’’ Products so designated may contain harmless coloring, flavoring, or blending materials as set forth in 27 CFR 5.23(a). (b) (5) (ii) ‘‘A blend of straight whiskies’’ (blended straight whiskies) consisting entirely of one of the types of straight whisky, and not conforming to the standard for straight whisky, shall be further designated by that specific type of straight whisky; for example, ‘‘a blend of straight rye whiskies’’ (blended straight rye whiskies). ‘‘A blend of straight whiskies’’ consisting entirely of one of the types of straight whisky shall include straight whisky of the same type which was produced in the same State or by the same proprietor within the same State, provided that such whisky contains harmless coloring, flavoring, or blending materials as stated in 27 CFR 5.23(a). (b) (5) (iii) The harmless coloring, flavoring, or blending materials allowed under this section shall not include neutral spirits or alcohol in their original state. Neutral spirits or alcohol may only appear in a ‘‘blend of straight whiskies’’ or in a ‘‘blend of straight whiskies consisting entirely of one of the types of straight whisky’’ as a vehicle for recognized flavoring of blending material. (6) ‘‘Spirit whisky’’ is a mixture of neutral spirits and not less than 5 percent on a proof gallon basis of whisky, or straight whisky, or straight whisky and whisky, if the straight whisky component is less than 20 percent on a proof gallon basis. (7) ‘‘Scotch whisky’’ is whisky which is a distinctive product of Scotland, manufactured in Scotland in compliance with the laws of the United Kingdom regulating the manufacture of Scotch whisky for consumption in the United Kingdom: Provided, That if such product is a mixture of whiskies, such mixture is ‘‘blended Scotch whisky’’ (Scotch whisky—a blend). (8) ‘‘Irish whisky’’ is whisky which is a distinctive product of Ireland, manu- factured either in the Republic of Ire- land or in Northern Ireland, in compli- ance with their laws regulating the manufacture of Irish whisky for home consumption: Provided, That if such product is a mixture of whiskies, such mixture is ‘‘blended Irish whisky’’ (Irish whisky—a blend). (9) ‘‘Canadian whisky’’ is whisky which is a distinctive product of Canada, manufactured in Canada in compliance with the laws of Canada regulating the manufacture of Canadian whisky for consumption in Canada: Provided, That if such product is a mixture of whiskies, such mixture is ‘‘blended Canadian whisky’’ (Canadian whisky—a blend).